TSTV will be launching Grand Sports 1 Xtra on the 22nd of April 2018. Grande Sports 1 Xtra HD (GS 1 Xtra)is a 24 hour channel dedicated to the upcoming World Cup. GS 1 Xtra will be bringing you the latest updates leading to the FIFA world cup Russia 2018 in real time. The channel will be free to view for one month on TSTV decoders. 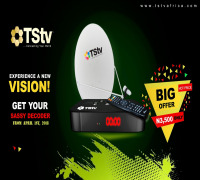 Recall earlier this month TStv introduced a version of their decoder called Sassy Decoder. This Decoder is stripped version of the main Decoder known as dexterity decoder which is said to come with unbelievable features like free data, wifi connections, pause subscription and lots more. However, when the company couldn't meet up with time, coupled with too much pressure from fans, they resulted to release a version to serve for the main time. From the information in my desk, Sassy Decoder will disappoint football fans who plans to watch live premier league matches, UEFA Champions League matches, Italian Seria A, French League 1, German league or even Spanish La Liga with the decoder. This is because there is no channel dedicated for this leagues yet. Meanwhile, the only channel that is confirmed to have the rights to broadcast 2018 world cup in Russia is the grand sport 1 Xtra which is also available in HD. But be it as it may, I won't conclude yet because TStv Sassy is still very new. I believe with time, more channels will be added. After all, both GOtv and Startimes started slowly before they got to this level.Also I'm using this opportunity to plead with TStv to improve in the rate of Decoder distribution because some people are still complaining that they can't see dealers around their area.